This is a guide for you to make the most our of your Treasures of Minto experience. All site features are detailed here to aid your investigations. 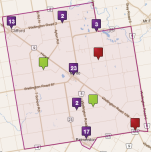 Treasures of Minto is a mapping of the culturally significant points of interest in the Town. Each location has been plotted on the map using GPS coordinates and applied one of our cultural filters. Not only can you learn about the many cultural points in the Town of Minto, but you can also read about our coming events and become a regional historian through our folklore. This window is a guide for you to make the most our of your Treasures of Minto experience. All site features are detailed here to aid your investigations. You can view this guide at any time on our map by simply pressing the “?” icon in the top right corner. Once you’ve browsed our interactive map, why not come and see our many sites in person? Treasures of Minto makes it easy to browse and learn about the Town’s many cultural features. We have identified all of our locations with a cultural theme, as listed below. You can select or deselect any of the filters at the bottom of your page, which narrows or expands your results accordingly. Your results will show on the right listings as well as on the map. When the Venues box is ticked, any location that is considered to be a culturally significant venue such as an arena or theatre will show on the map. The Town of Minto is full of natural beauty just waiting to be seen. Minto’s many trails as well as agricultural and horticultural wonders can be found in this category. Culture is so much a part of day-to-day life that many of us have turned it into a living. This is where you will find listings of some of our great shops, artisans and restaurants. Minto has some absolutely fascinating heritage features, and this is where you’ll find them all in one place. Celebrate our diverse history with us! Our many clubs, guilds and societies give so much to our Town and Minto and it wouldn’t be what it is today without its amazing volunteers. Find out about them here. Using the Treasures of Minto map is a simple process. Multiple listings on the map show in a single icon with the number of locations therein. To view these separately and geographically, zoom in using the tool or by clicking on the number icon. Depending on how you have refined your map by selecting categories, your results will not only show on the map but also in the right-hand locations display. From here you can select a specific cultural point and a detailed expanded window will open up. But do not worry if you want to go back or have lost your way, there are always breadcrumbs to take you back home again. You may also refine your options by searching for words or towns, as indicated above. Have a look around and view the beautiful photos and videos, and when you see something that you like make sure to share it on Facebook or Twitter!